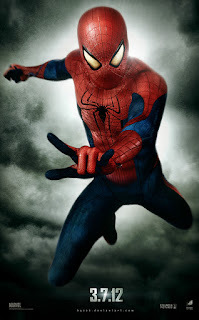 Reality by Rach : 'Amazing Spiderman' Trailer Debuts! Early this morning the full length trailer for the upcoming The Amazing Spiderman debuted. And I've got to say, while it looks fun and definitely something to see in theaters it felt too much like Batman Begins. Now some of you may argue that, 'that's the point!". And while yes, it is supposed to be dark and gritty, as this tends to be the direction most new Superhero films are going. It just felt ripped from the pages Nolan's Batman ideas! The line that REALLY got me was Dennis Learys' "We will arrest the masked vigilante known as Spiderman." WHAT?! Come on now, if that doesn't wreak Batman dialogue then I don't know what does. But what are your guys' thoughts? Did you like the trailer and are you excited to see the film starring The Social Networks' Andrew Garfield and Emma Stone?? Let me know on the RBR Facebook Page!